(A passing wind to get your attention, that last bit). The first America’s cup in 1851 was an unequal contest between the schooner ‘America’ and a fleet of the best of British- and to tilt the playing field even further, ‘America’ had to sail across the Atlantic to Cowes while the English fleet were all specialist inshore racing yachts. During the extended after match functions, the Marquis of Anglesey (who’d lost a leg at Waterloo 34 years earlier), went for a sail on ‘America’, and climbed out on it’s bowsprit for 20 minutes to study the bow wave. English hull design theory of this time mandated that yachts should be wide at the front, long and tapered towards the back (sternly eschewing nautical terminology here). This derived from the false belief that raindrops ‘naturally’ assumed an optimal shape for minimising drag. By contrast, ‘America’ was the opposite; long and thin at the front and with a rather curvaceous back end. I now find myself in somewhat the same situation with respect to single line kites (and maybe even traction kites) -by which I mean I’ve been building kites upside down (rather than also being an old fart sometimes to be found hanging legless from the rigging). In hindsight, I obviously should have taken more notice of how often my kites seem to prefer to fly belly up. In defence, blame really belongs to Ray Merry and Andrew Jones, who, back in the ’70’s, invented the Flexifoil power kite with it’s revelatory upside down airfoil sections. 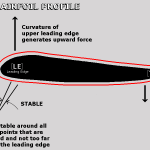 Conventional “cambered” profiles have more lift and are more efficient than other single element airfoils but aren’t angle-of-attack stable. They have a distressing tendency to suddenly rotate forward and dive down nose first out of control (called a luff). Aeroplanes control this tendency by having a tailplane out the back (or sometimes a small canard wing out in front). Flying wing style aeroplanes with only a main wing, have a distressing tendency to luff (aeroplane people call this pitch instability) with often fatal results- hence they aren’t very popular. Reflexive ‘Flexifoil’ style profiles are angle-of-attack stable. 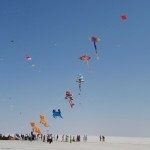 They strongly resist luffing, hence their popularity with kite designers. But, unfortunately, they can’t generate as much lift for their size and aren’t as efficient (their drag being higher proportional to lift) as cambered ‘foils- which is why bridled ‘foils (which are conventionally cambered) dominate buggy racing even though they’re trickier to fly, and why flying wings can’t use enough reflexivity in their profiles to make them completely pitch stable without becoming uncompetitive against aircraft with conventional wing and tailplane form. Thinking of single line kites as basically tethered flying wings, almost every soft single line kite I’ve developed, from the Octopus, Ray and Trilobite through to Pilots, has therefore used reflexive profiles for stability and luff resistance. But now I know that this has been unnecessary or worse; at least in some cases. The first glimmers of doubt came from various pilot kites and then the fish kite for UKS (Ultimate Kite Show, now Air Banners). Contrary to what I’d expected, using camber rather than reflex seemed to make these kites more stable. Solid evidence was there if I hadn’t been so blinded by the reflexive profile mantra; Jurgen Ebbinghaus’s cambered fish kite flies very well in every wind from nothing to too much,- and Flowforms often have extreme camber in their side profiles to apparently beneficial effect. So, later last year, fresh from solving the Ray problem that had plagued me (and everyone who flew one or near to one no doubt) for 22 years, I thought to try a new Pilot design. My bosses (licensees) want high flying angle and lots of lift in light wind, with as little increase in pull as possible when wind speed increases,- and there is no such thing as adequate stability in their view. What I soon found was that positive camber not only improved the flying angle, improved stability and provided heaps of de-power, but that it didn’t provoke luffing either- which was still something of a surprise. The better flying angle is obvious, but I now sort of have explanations for the other gains. For the de-power and stability it’s that with a cambered airfoil, the kite’s angle of attack decreases in response to increasing wind speed- which reduces lift (hence the de-power) and allows a single line kite to maintain stability (instability is driven by lift forces while stabilising forces are a function of drag). But how come this camber driven reduction of angle-of-attack with increasing wind speed doesn’t continue until the kite luffs? But it doesn’t, so once again the theory has had to follow rather than lead. It appears that luffing can be avoided when using cambered profiles provided they are free to find their own angle-of-attack independently of line angle. If kites have ‘long’ bridles in the chordwise sense (and 4 line traction kites have the longest- they extend right to the flier) then they require either quick reactions from the flier (4 line kites) or reflexive profiles, so as not to luff when they overfly. They also require either fairly symmetrical leading edges, or high leading edges (like are usual for Flowforms) so as to prevent their noses dipping under the wind when rearward camber lifts the kite’s trailing edge. Combinations of camber and a hooked down leading edge definitely cause uncontrollable luffing, regardless of bridling. These new series Pilots have just 4 bridles and are relatively free to optimise their angle-of-attack. In response to gusts and during climbs to altitude, angle-of-attack decreases when required- slowing down apparent wind surges to provides de-power and better stability. When I tried reflexive profiles on a prototype instead, it just zoomed right to the apex (because the angle-of-attack then stayed relatively constant irrespective of speed through the air), pulled like crazy during this surge, and, as a consequence, started to figure-eight when lift forces overwhelmed stabilising forces. 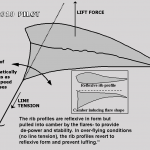 This is a new insight for me- but there are kites out there (some Flowforms for example) which have always used camber rather than reflex, and our standard 8sq.m Pilot series has used some camber (induced by the flare shape) for years also- though I never really understood why this worked until now. Anyway, though I really dislike having to dredge up theories to explain things after the event, I dislike having kites that don’t fly as well as they might even more. So, theory has again had to follow in the wake, catching up when it can. When will there be a truly predictive theory of kite stability?! They have some promise I think; can fly in lighter winds, have more pull down low- but less in stronger winds, and are so steady as to be scary sometimes. No gain without pain though- currently when tipped over (which rarely happens, even in wild turbulent conditions), they sometimes go straight down without recovery. An interesting innovation is that their centre leading edge bridle attaches to the upper rather than the lower leading edge. This is better for launching and re-inflation, and allows another pilot to be stacked above without having a central slot like some previous pilot designs have sported. All the prototypes were 10sq.m, but I expect that the range for this design will be: 7sq.m, 12sq.m and 22 sq.m- for about the right size gaps and to suit fabric dimensions. These will be additional to, rather than replace current models. Because the mass of air inside soft kites (which effects how quickly they respond to wind direction changes) scales with the cube of dimension while aerodynamic forces scale with the square, making larger sizes is not just a matter of increasing all dimensions proportionally. So that it responds appropriately, the 22sq.m versions of this series use an aspect ratio (span to length) which is 3.5% less than for the 10sq.m (but this is not a linear relationship so sizes smaller than 10’s can probably be simply proportioned). 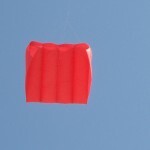 22’s are available from PL Kites Ltd and from Airbanners now- and they really are lifters rather than pilots- will just sit up there solid as a rock lifting whatever you want into the sky. 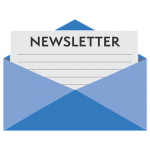 I would like to publish plans so that kitefliers can make their own versions- and there are a few tricky features that even an unpick-and-copy person might not twig to- but my licensees have the view that this would likely lead to commercial scale copying, which could significantly cut into sales. They’re right, we’d probably be shooting ourselves in the foot (feet? )- but with other experimenters trying variations based on their(rather than my) half baked theories perhaps a few other things I’m no doubt getting wrong might get fixed. And there are two other consequences of the camber rather than reflex approach to stability. 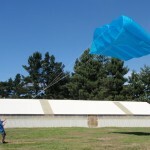 For traction kites, there is the potential to increase the lift coefficient (pull for size) and lift-to-drag ratio (efficiency) – provided the flying lines can converge close to the kite. For single line kites there are really exciting (for kite trolls like myself) possibilities for new dynamic stability mechanisms. This will be the subject of a newsletter later in the year. Next month I expect there’ll be something rather more dramatic to report. PS Media reports out of India last month that I featured in were bogus. I never had any Tigers cut- didn’t happen- and as for being intimidated by “slum boy kite fliers” – yeah right! The Indian press certainly doesn’t let facts stand in the way of a good story. An excellent set of festivals though!